THE MISSION is pleased to present Mental Landscape, an exhibition of recent graphite drawings by Argentine artist Mariana Sissia. In her second solo exhibition at THE MISSION, Sissia presents a series of landscape drawings on rice paper. Mental Landscape features large-scale, scroll-like drawings, as well as a 65-foot drawing installation that drapes over iron bars throughout the gallery. An opening reception will be held on Friday, March 13 from 6 to 8pm. The show continues through Saturday, April 25, 2015. Mariana Sissia’s delicate drawings begin as layers of “frottage,” a technique developed by German surrealist artist Max Ernst in 1925 where graphite is rubbed onto paper placed on textured surfaces. 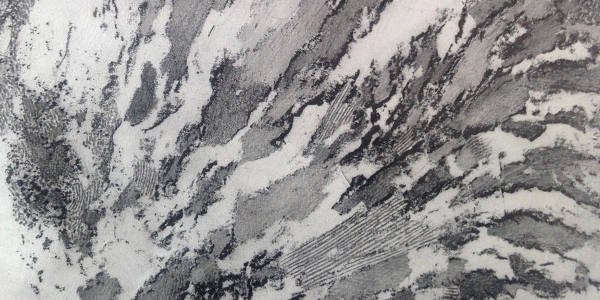 She uses varying materials –- cement floors, walls and stones –- to build layers of graphite rubbings that she further refines by hand. The materials Sissia sources in her drawings transform into complex graphite renderings that are products of the artist’s own cognition. Through thought, experience, and sensation, she produces ethereal compositions without reference to geographic features that landscape often suggests. [In this series], we find, not a place nor even a point, but a conception in the mind. Sissia calls this series of work Mental Landscape, where the artist traces an order that one cannot quickly grasp, the order of emotions and sensations, something similar to the feeling of your own skin, your hair or your body. Sissia’s drawings are not a “thing,” but a layer of a thing that proposes an order that can be contained in paper. Their space is both physical and abstract – concerning materials and matter, and escaping precisely being a thing. An exhibition brochure featuring an essay by Ionit Behar, curatorial assistant at Gallery 400, will accompany the show.